Alright .. this is messed up .. but I’ve got to bring you up to date on a few things. Sure, I’m still writing about my trip to Ohio .. and that was over two weeks ago .. but I will get back to all that. I have to tell you about last night .. it will freak you out. So .. I had a long weekend, I was out doing shows and I wasn’t feeling too hot .. I wanted to get a good nights sleep. I took a swig of Nyquil and it was off to bed .. I think I was watching a little of “Everybody Loves Raymond.” About half way through … little Rex jumps off the bed and heads out into the hallway. Now you see .. this is very unusual, then I hear a little scuffle in the bathroom. Sure enough, he’s got something on the floor .. I thought it was a mouse, and then it flew!! 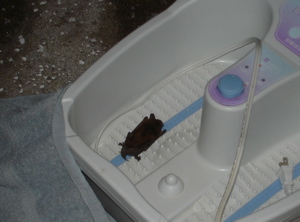 It was a little brown bat … yes, a bat in the middle of winter … in my bathroom! Nothing like a little excitement around the house.